Michael Bradley will always be the coach’s son. 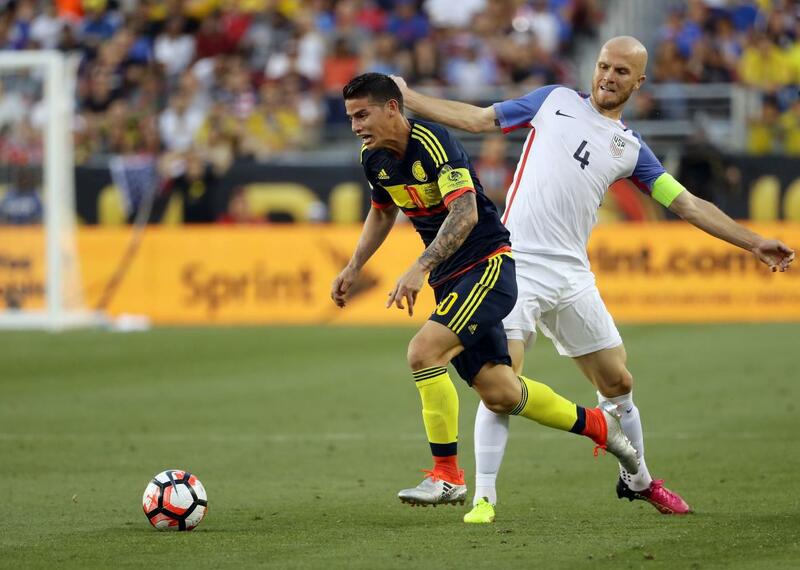 James Rodriguez of Colombia trips on Michael Bradley of the United States during the 2016 Copa America Centenario group match between the United States and Colombia at Levi’s Stadium on June 3, 2016 in Santa Clara, California. The U.S. men’s national soccer team faces Paraguay Saturday in its third group-stage game of the Copa America Centenario, the Western Hemisphere’s new and exciting method for converting high-level soccer into money. After splitting its first two games with Colombia and Costa Rica, the U.S. needs at least a draw to advance to the knockout stage. As has been the case for the past several years, the team’s success depends on one man: central midfielder Michael Bradley. Or at least it feels that way. Opponents know the easiest way to beat the U.S. is to take its captain out of the game. In the United States’ first two games, a swarm of opposing midfielders and backchecking attackers harried Bradley every time he touched the ball. In the 2-0 loss to Colombia, he coped poorly with all that the pressure. With Jermaine Jones tasked with providing defensive cover on the left flank, Bradley completed just 77 percent of his passes and turned the ball over in dangerous spots a couple of times, including in the buildup to the handball that led to Colombia’s second goal. His poor performance set off a new round of hand-wringing over his partnership with Jones and his ability to handle that pressure. This is hardly a new phenomenon. Bradley is our national coach’s son, the player we attach our hopes and dreams to. That’s how he entered the public consciousness, and that perception has colored his entire career, even as his role and our expectations for him have shifted. Bradley was drafted out of high school by Major League Soccer’s New York/New Jersey MetroStars, a team coached by his father, Bob Bradley. He earned his first start for the U.S. men’s national team in 2006 at age 19, again with Bob as the coach. You can’t play high-level sports for your father even once without someone crying nepotism, but Michael played his way through doubts about his ability only to find doubts about his maturity arise in their place. His physical, sometimes reckless presence as a defensive midfielder earned him if not an inordinate number of yellow and red cards, then at least a number of ones that seemed avoidable. Which they were, because soon he began avoiding them. In the run-up to the 2010 World Cup, it was clear the reps he’d been given early in his career had paid off. At age 22, he was one of the team’s most important players, holding down the middle of the field and scoring vital goals with late-breaking runs into the box while opposing defenses keyed on Landon Donovan and Clint Dempsey. This was the coach’s son not as star but as vital cog: dutiful, willing, his “lock it down then pick the right time to break” approach the perfect summation of his father’s style. Until it wasn’t his father’s style anymore. The elder Bradley was fired after a 4-2 loss to Mexico in the 2011 in the Gold Cup final, and U.S. Soccer finally captured its white whale: Jürgen Klinsmann. Klinsmann talked a lot about expanding and diversifying the player pool, and Bradley was one of his first casualties. Klinsmann left his predecessor’s son off the roster entirely for friendlies in September 2011 while Bradley was between clubs, then brought him off the bench. Message received: This was not his father’s national team. One would have thought that Bradley could have figured that out on his own, but Klinsmann does have a habit of sending messages via his roster decisions. But Bradley was too good to be ignored for long, and he kept getting better. His passing grew more incisive, his awareness more complete. His well-rounded game remained well-rounded. This versatility is a trait of another kind of coach’s son, the one who’s easily molded, so he can be used to plug in the gaps. For much of Klinsmann’s first World Cup qualifying cycle, the coach asked Bradley to play a more restrained role next to the explosive Jones, Sal Paradise to Jones’ inexhaustible and often frantic Dean Moriarty. After years of play for the U.S. that could be charitably described as erratic, Jones broke out in a big way at the World Cup in 2014, displaying an Old Testament combination of toughness and omnipresence even before he unleashed that righteous thunderbolt against Portugal. With a rampaging Jones in place and dreadlocked dreadnought Kyle Beckerman shielding the defense behind them, Klinsmann cooked up a new scheme for Bradley, asking him to play as the most advanced U.S. midfielder. On many of the world’s teams, this is the starring role. The No. 10 shirt associated with the central playmaker is a coveted honor given to a team’s most important attacking player, an offensive standout who is often freed from the most grueling defensive duties. It’s a luxury spot, the natural endpoint for a coach’s son, the equivalent of the quarterback or point guard position. In Bradley’s case, the role looked a little different: He would direct attacks from deep in the heart of the enemy’s defense and use his otherworldly stamina to get back into position in his own team’s defensive half. He covered more ground than any player on any team during the first three games of the World Cup. It’s a position everyone but the man penciling his name onto the team sheet seemed to understand wasn’t the best fit for Bradley’s talents, and he struggled in it at times. His offensive skillset has appeared best suited to transitioning play from defense to attack, hitting long diagonals to runners on the wings and driving past an overcommitted opponent with the ball on his foot. He plays the pass before the pass that unlocks the defense. Asking Bradley to be an advanced playmaker was akin to telling Batman to fly up there and catch that falling plane. Bradley filled this role because Klinsmann didn’t trust any of the potential Supermen in the U.S. player pool, guys like Benny Feilhaber, Sacha Kljestan, and Lee Nguyen. He seemed the best man for the job, even if it wasn’t his best job. His versatility proved more valuable than any of his other qualities, and because he was a good soldier he filled the role without complaining. Somewhere along the way, he became unquestionably the best U.S. player, capable of highlights like this hockey assist. Last year, Bradley won U.S. Soccer’s Male Athlete of the Year Award, and the only surprising thing about it was that it was his first one. And this summer, for the first time in a while, Bradley is regularly playing the same role for his country as he does for his club, Toronto FC. As the deepest U.S. midfielder, Bradley has room to unfurl those long passes and can use his anticipation to snuff out attacks at their most dangerous point. Everything flows through him; even from a deep position, he still might be the team’s most important offensive player. Those worries post-Colombia faded after Tuesday’s 4-0 win against Costa Rica. Bradley played well, completing 90 percent of his passes against a much less effective defense. Though he did make a long diagonal pass to help set up Bobby Wood’s goal, Bradley didn’t stand out. His play and the attention he drew did, however, let Jones and Dempsey shine ahead of him. Which is fine. He doesn’t have to star every game, just be good enough that someone else can. He’s a cog, but the most important one. If Bradley does play poorly against Paraguay, it doesn’t have to lead to a referendum on his position or his talent level. For his entire career, we the American fan base have been the overbearing parent. We always want a little more out of him, even when he’s doing everything. Maybe it’s time to let Michael be Michael. Have fun out there, Michael Bradley. We love you no matter what. Read more Slate coverage of Copa America.